How do you measure the success of your mobile user engagement plan? What are the best practices for user onboarding? 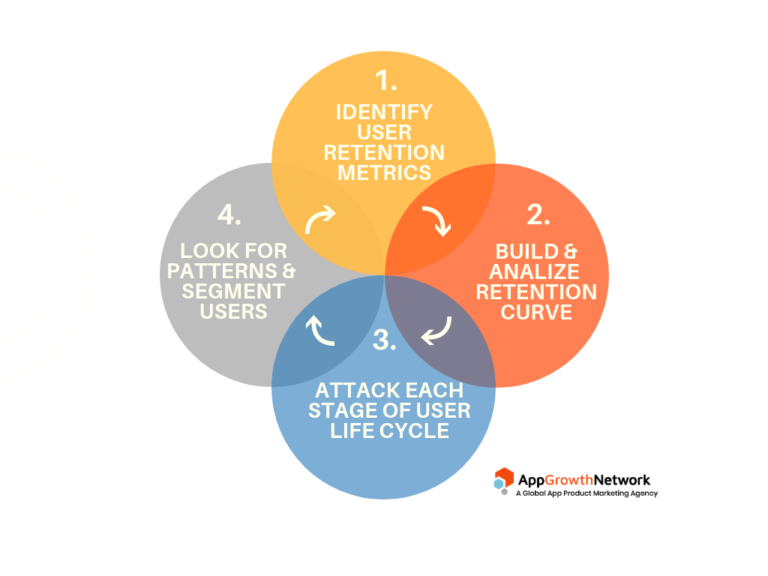 How to increase user retention of your mobile app? How to monetise your app users to drive more revenue? What are the best practices for reducing churn and re-engaging uninstalled users? How to Measure Success of Your Mobile User Engagement Plan? Before you start to implement any mobile user engagement plan, it’s vital to determine the end goal of the campaign which would be your macro goal. To reach this macro goal, you’ll have to attain various micro goals. As we all know, user onboarding is all about educating the user about your product and making them experience the product ‘aha moment’ as early as possible. What can you do to improve user onboarding then? 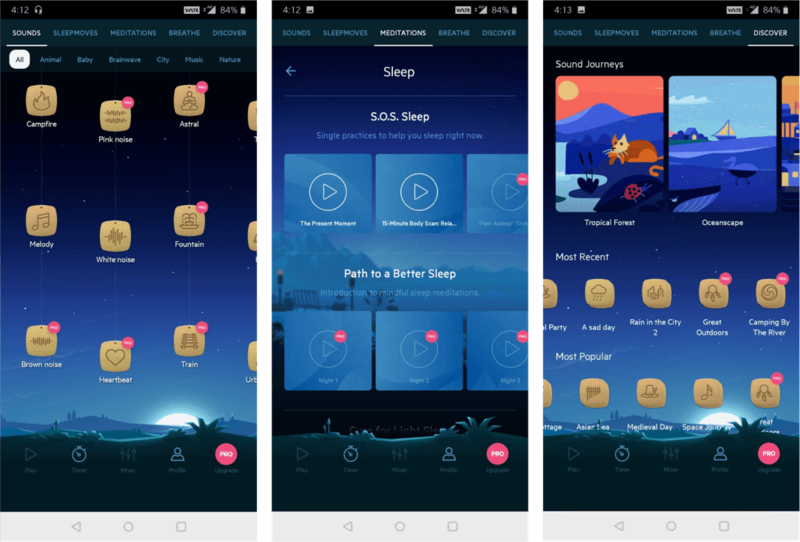 In this section, we will share examples from Relax Melodies (the client of App Growth Network) which is a mobile app for sleep and relaxation. Grabbing users attention during the first open of your app is the key to getting these very users to the next step of their app journey. So during the first app open, share how the app is solving a certain problem instead of talking about app features. 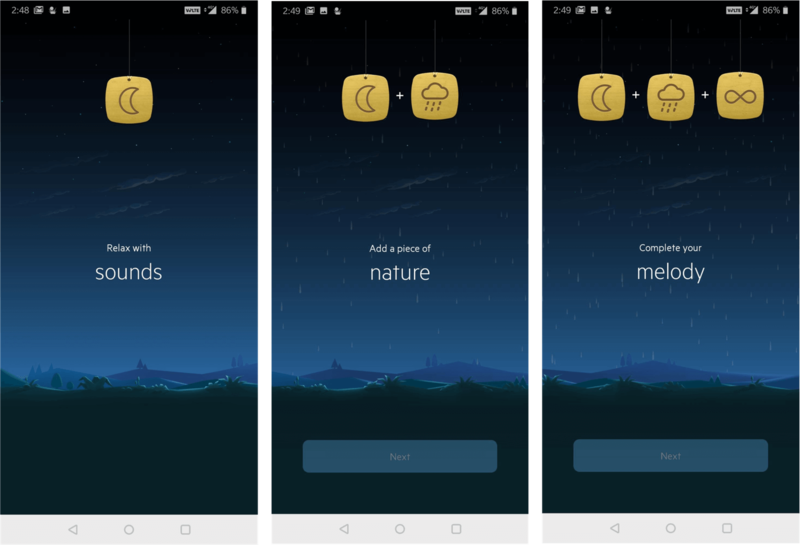 Here are screenshots from Relax Melodies that showcase how to communicate app core features in the tutorial section highlighting app value for users. Keep the sign up process simple if you want to increase mobile user engagement. Just ask a user to add the minimum required input. Ask for more details only as the user moves further into your app journey. This process allows users to experience essential product features first. Once a user finds your product suitable for their needs, they’ll be happy to invest more time and will be more open to sharing additional details. Here is how Relax Melodies designed its sign up process. They make the initial sign up optional. 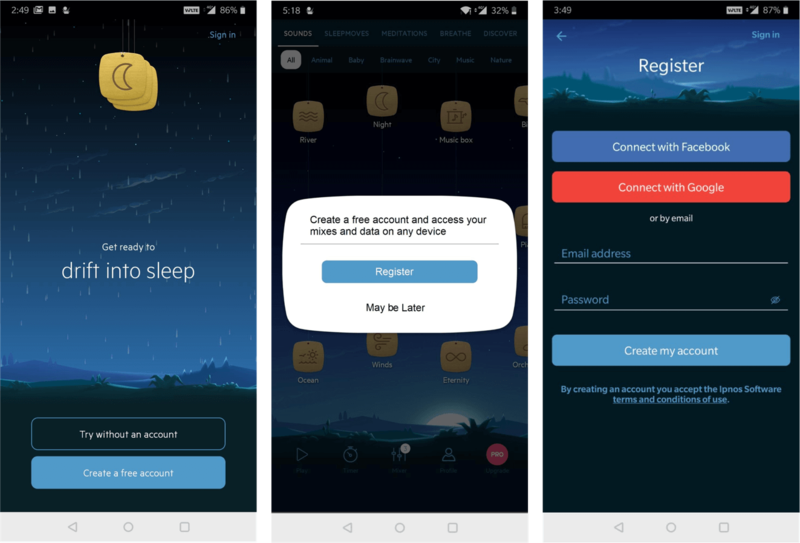 Once a user is comfortable and moves further into their journey, the app asks them to register. The app developers still keep it simple and give the option to create an account using Google/Facebook or Email Address. Using your app analytics tools, check out users paths/screenflow along with the average time it takes for a user to move from one step to the next. Build funnels and figure out the maximum drop off points along the path. It’s worth trying to activate users who are inactive or haven’t moved to the next step in the average time you’ve calculated. This is how App Growth Network builds a customer journey campaign for their clients using Braze. The goal of the campaign was to make users who have newly installed the app to complete the app registration. So, based on whether a user has registered or not, they were sent push notifications on day 1, day 3, day 5. The messages dwelled on how the app for document signing can help save time, keep documents organised and empower business. On the other hand, if a user has experienced the app features first hand and stays over a period of time, there’s a chance that they see value in your app and can be converted into paying customers. For example, Netflix, Linkedin, etc. offer one month of free trial for the premium version. Similarly, here is another way of letting your users experience product features. Relax Melodies allows users to experience some part of each section for free and upgrade to paid/pro version for more. 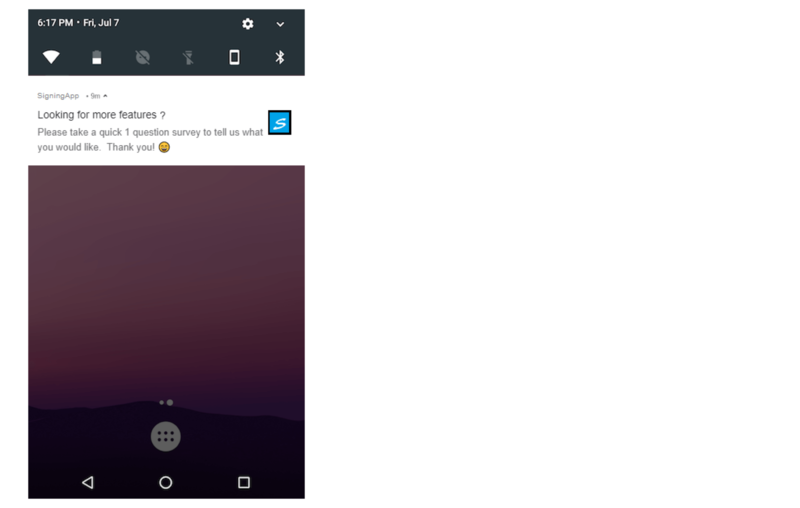 It goes without saying that sending too many notifications won’t improve mobile user engagement. So be sensible here and always ask user permission. Otherwise, you’ll only annoy users and it’ll result in multiple uninstalls of your app. Engage with users using multiple channels like email, push notifications, in-app notifications, retargeting on social channels, etc. The channel selection should be made based on the stage of a user journey and communication that is being delivered. How to Improve Mobile User Engagement Taking Care of App Retention? The longer you are able to retain a user, the more chances you have to increase user LTV (Lifetime Value). 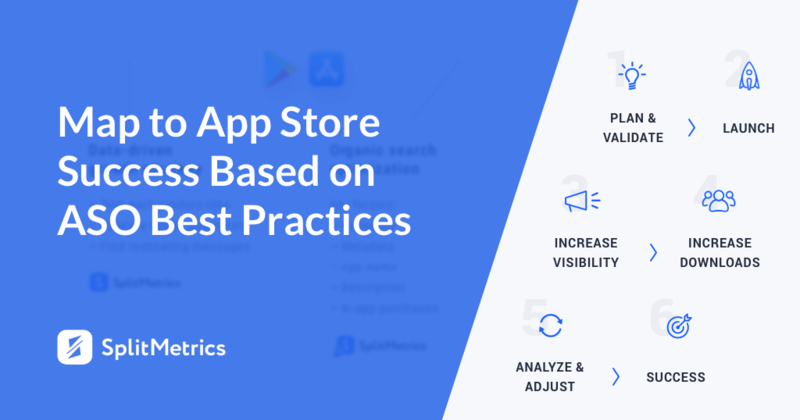 So here are a few practices that will help to increase your mobile app user retention and eventually improve overall mobile user engagement. Retention is all about being able to serve users well and keeping your app on the top of users mind so that they use it again and again. It is a continuous onboarding process. So in order to increase your app retention, engage with segmented users via push notifications or email. Target the users that were active on the app once but has not used the app recently. For example, when it comes to e-commerce, it’s a good idea to engage with a user who was an active buyer in the last 2 months but stopped buying things. You can send them an enticing product in which they have shown interest earlier. It’s a simple yet efficient way to make this user purchase again. In case of content apps, if users were active for 7 days straight but haven’t opened the app in the last 3 days, you can try to send them an article link which is trending in the category they’re interested in. It might bring users to your app again. Amazon Prime is a great example which validates this model. For an e-commerce user, the best reward is to get a free product delivery within 2 days which is the core offer of Amazon Prime. Everytime a user buys something, the app offers to subscribe to Amazon Prime at $99/year. Once the user has invested $99, they tend to choose Amazon over other platforms and with each new purchase Amazon shows how much you have saved by subscribing to Prime. 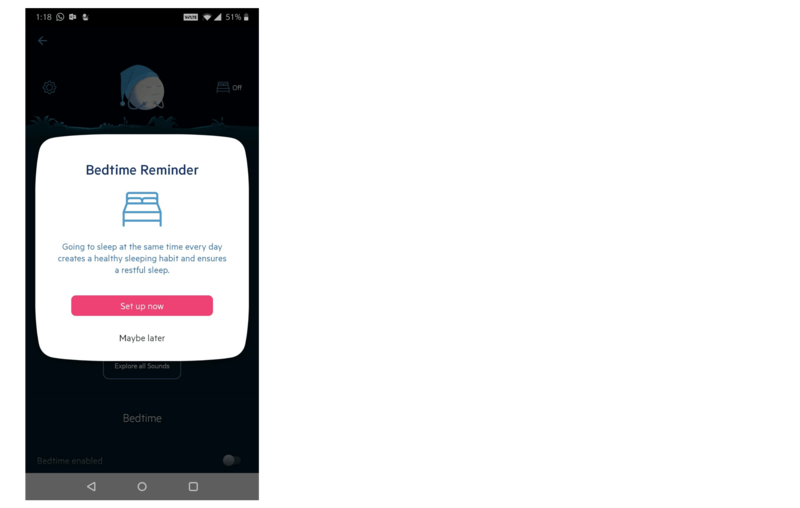 Here is another example from Relax Medolies – user habits are built by setting a daily reminder at a fixed time and if a user has been active on the app and hasn’t set the reminder, the app sends the push notification offering to do it. Always notify your users about new things that are being added to the product. When it comes to SAAS services, try to share new features that are in pipeline. This keeps a user excited about the app. Yet, it is important to time the communication right so it doesn’t seem that it is just a bait and nothing is coming. Set experiments and figure what would be the right time to talk about an upcoming feature: a few days before the launch, weeks or maybe months. 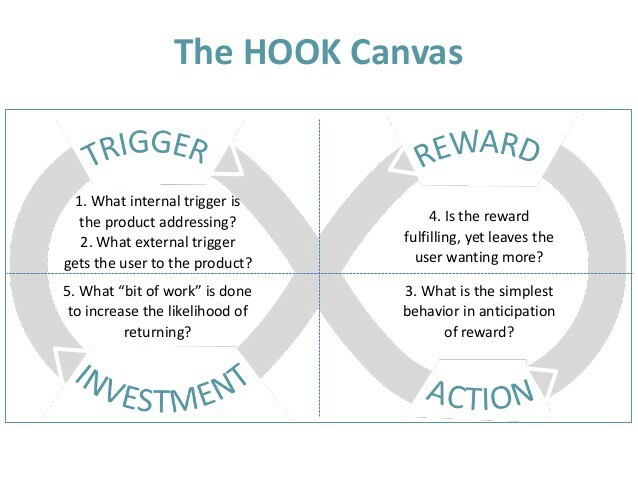 Mobile User Engagement: How to Convert Users into Paid Ones? Any app developer wants to earn more revenue from a user via paid app download, in-app purchase, transactions (for e-commerce) or advertising (for content apps). The first step to app monetisation is to analyse the data and user path. These basic actions help to determine the barriers to generating revenue and point where users are stuck (for instance, at the payment gateway or in between points). 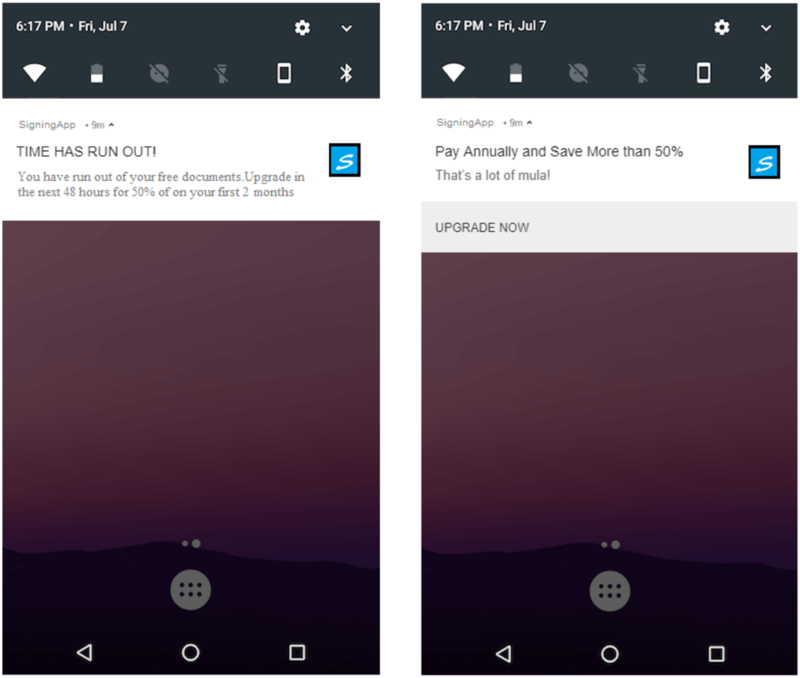 Once you have figured the drop-off points, it’s necessary to send push notifications/emails to the users who have dropped on the moments that meant to move them forward. As for the users who have made payments successfully, you try to upsell them more product or higher subscription packages based on your model. Here is how App Growth Network increased mobile user engagement using Braze to convert the most active users into paying customers. The above-mentioned example also shows how they encouraged upsell to yearly subscription package by targeting users whose monthly subscription was to end next day. The users were sent the message which highlighted that annual package helps to save more than 50%. As a result, the number of yearly subscriptions increased by 10%. 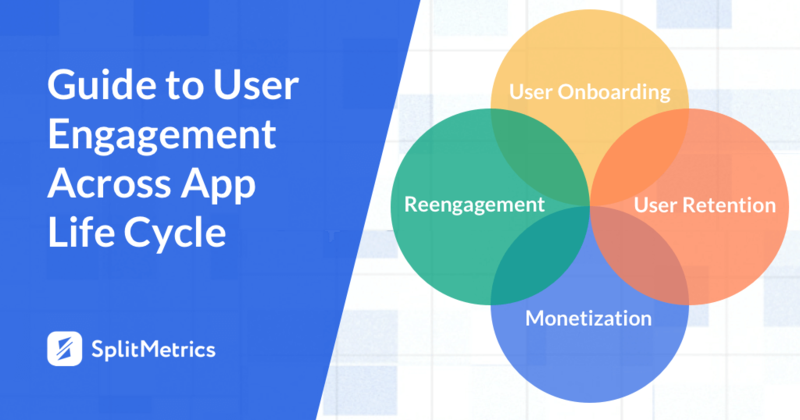 Conduct surveys and find out which app features are the most valuable for your users. Build your product pricing based on the survey and competition analysis. Here is how App Growth Network engaged with paid users segment by sending a survey. Its aim was to identify the most anticipated features. Sometimes offering a product for free can be cheaper than acquiring users. At times it makes sense to let users experience your app premium features for free. The psychological principle of reciprocity works here: when marketers offer something for free, users feel obliged to pay back. In case of SAAS services, free webinars is a great option. 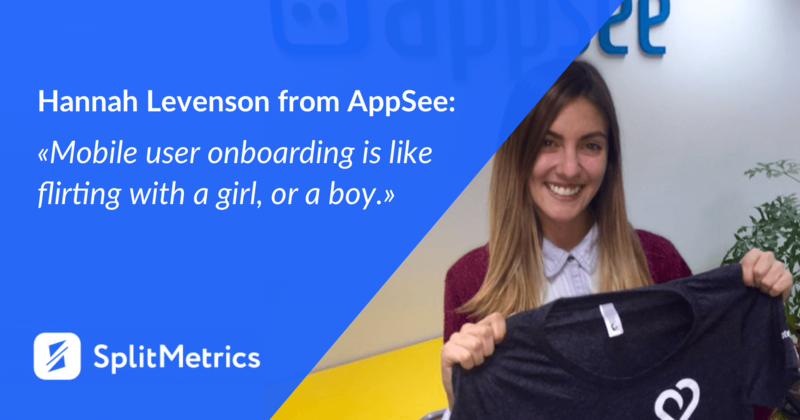 Potential customers get valuable information and understand the value of your app. They understand the need for the product as well as feel obliged to payback by opting for a paid service. 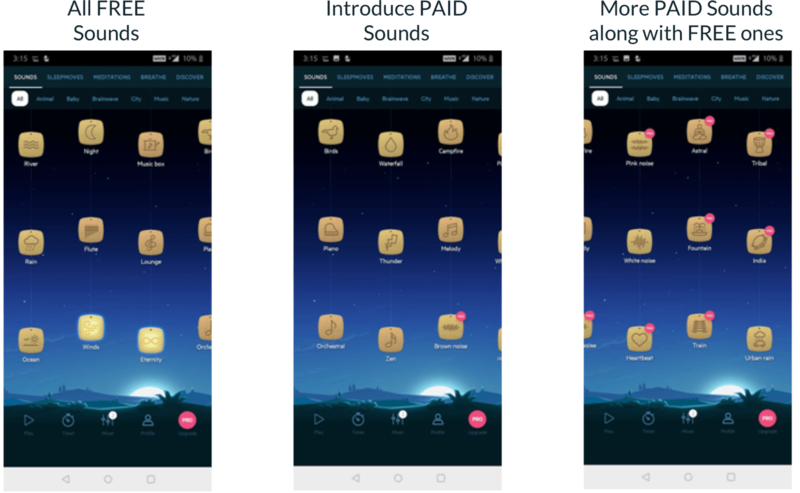 Here are the screenshots from Relax Melodies app which show how users are allowed to experience only free sounds (on the first screen), the second screenshot had both paid and free sounds, the third screen offered more paid sounds than free ones. Acquiring a new user is 5-25x more expensive than retaining an existing one. So here are a few mobile user engagement activities that can help in reducing churn. Every step of mobile user engagement starts with data analysis, churn prevention is no exception. 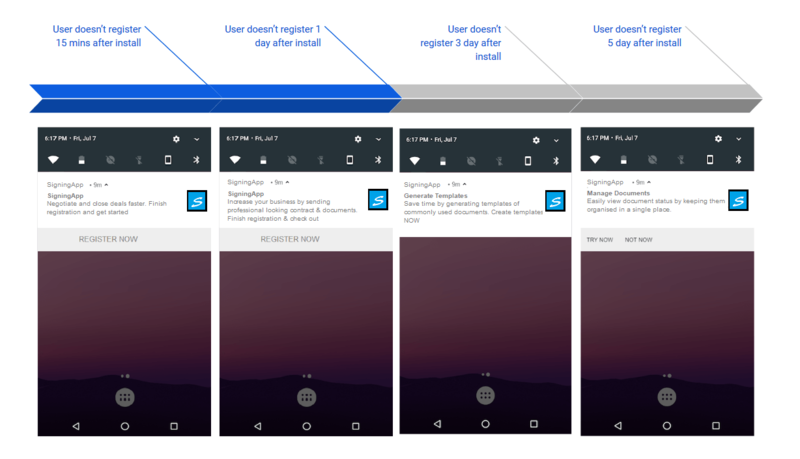 Analyse user paths and funnels to identify what is the typical time period after which an inactive user is not likely to return to your app ever again. Equipped with these insights, you can do your best to engage users once they start slipping away. For example, you can send them special offers for paid features a user values the most. Another mobile user engagement tactic is to send a survey and check why a person hasn’t used your app for a long time. However, make sure you respond well to their concerns once users reply to such messages. It goes without saying that there should be a tool at your disposal which will help you measure uninstalls. There are a lot of product engagement/push notifications platforms that has this uninstalls tracking feature. It’s a common mobile user engagement practice to send a “we miss you” email to the users who uninstalled your app. It’s really important to ask why they did it. According to App Growth Network, around 12.5% response rate to uninstall feedback emails is a pretty good result which means your email is done right. If your response rate is more humble, it’s a sure sign to review the content of your letter. Here is an example of Hulu. Note how well they designed their ‘we miss you email’ and empowered it by offering users 2 free weeks along with showing content based on a user’s past viewing patterns. Unfortunately, there’s no golden pattern which will help you keep users engaged once and for all. Mobile user engagement is a never-ending process and each app is unique. That’s why it’s recommended to experiment with different tactics and hacks on various user journey phases. However, hard work pays off and eventually, you’ll be able to come up with a few performant growth strategies. This guest post was created by Gopika Gupta, a Growth Marketing and Analytics specialist at App Growth Network – A Global App Marketing Agency. She has over 10 years of experience studying the analytics of mobile applications.